When we last left Team Arrow, everyone except Oliver and William look like they were blow-up thanks to Adrian Chase’s bombs on Lian Yu. We fast forward 5 months later and we see Team Arrow chasing after a man named Faust before he can launch a ballistic missile on Star City. Everyone is helping out meaning Rene in a new Wild Dog costume, Curtis/Mr. Terrific, Dinah/Black Canary, Diggle/Spartan and holding down the Arrow Cave is Felicity/Overwatch. The team do manage to capture Faust and prevent his missile from hitting Star City. Since the island flashbacks are over, we do flashback to moments before the bombing to learn how Team Arrow survived. The majority of the team used the broken plane as a shield to protect them from the blast. However, Samantha went after William with Thea following suit. Felicity trips on the way to the plane and Diggle goes back to get her just as the blast goes off and we see him get caught up in it. We also learn that Nyssa survived the blast. Back to the present, Dinah is interrogating Faust and wondering how he had the money to pay for mercenaries but he isn’t talk and just asks for a soda. A cop then asks Dinah where Quentin is as he was supposed to be at the SCPD for a meeting about the police academy graduation. Dinah sees that she got a text from Quentin and finds him at a bar very tempted to down some shots. Quentin feels guilty over something, which we learn later. Dinah manages to talk him down from the ledge. While Dinah is dealing with Quentin, Faust uses the soda to set up an explosive device in his tooth. This allows Black Siren and her gang to come and break Faust out and blow up SCPD to smithereens. Meanwhile, Oliver has taken in William with his old housekeeper Raisa as his nanny. Oliver is having a tough time connecting with his son. Even with all that going, it really does look like Olicity is reuniting. Other changes is that Rene is now Oliver’s chief of staff replacing Thea. At the Arrow Cave, Quentin thinks that Black Siren was after him and team is surprised that she is alive since he and Dianh told them that she was dead. Eventually the team manages to track down Black Siren and her thugs. 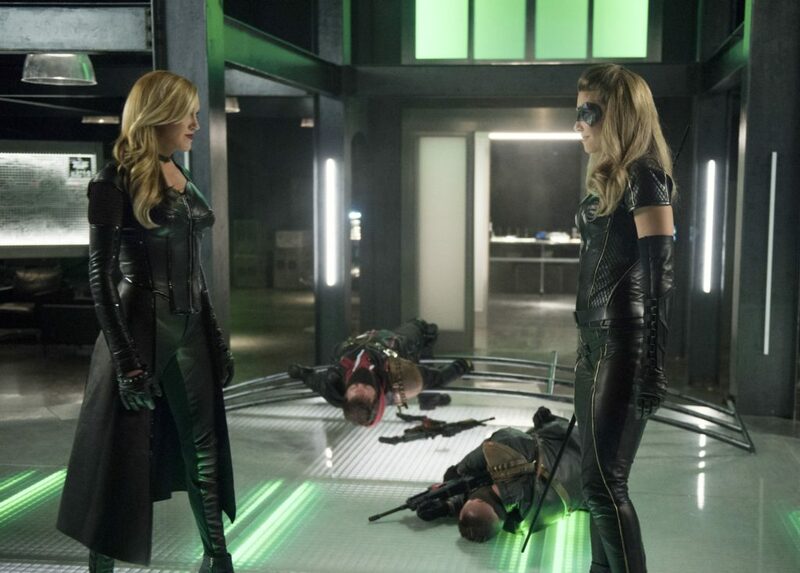 When Team Arrow goes to confront them, we get Canary versus Canary that ends in a stalemate. There is a moment where Diggle is unable to fire his gun that results in Rene being thrown off a bridge that Oliver has to grab him. Unfortunately, when two crash down on a hood of a car, Rene is badly hurt. Felicity manages to trace Black Siren’s former hideout and when Dinah and Diggle check it out the two have a conversation on what really happened on Lian Yu with her and Quentin. Dinah says there is nothing to tell and before anything more can be said, Diggle finds a map of city hall. Team Arrow realize that Black Siren is targeting city hall as that is the new location for the police academy graduation. Quentin insists on being there and tells Oliver the truth in that Black Siren was alive but was going to kill Dinah and he shot her. Quentin feels guilty for leaving his daughter for dead. Oliver tells him that Black Siren isn’t his daughter but Quentin disagrees and says that Black Siren his is Laurel but refers to her as evil Laurel. Oliver then shares his woes with William, who blames him for killing his mom, calling him the bad man of his nightmares (Oliver thought he was referring to Chase). In flashbacks, with Lian Yu burned to the ground, Oliver finds Slade who tells them they found Thea and she looks dead as Oliver mourns over her body. Samantha comes stumbling out of the woods and asks if William is safe. When Oliver assures that he is, Samantha gets him to promise to be a dad to their son. Oliver promises as Samantha dies in his arms. Team Arrow steps up the protection of the police academy ceremony, Diggle stays behind to run comms while Felicity and Curtis are at city hall using bomb tracking device in hopes of stopping Black Siren. The ceremony goes without a hitch as the real target was the Arrow Cave. Diggle is ambushed and is reluctant to fire his weapon. Luckily Team Arrow come to the rescue. We get another showdown between Black Siren and Black Canary (and I am sure we will get a lot more during the season). Black Siren gets away when she denotes explosives in the bunker. Quentin tries to stop Black Siren but can’t bring himself to shoot his “daughter”. In another flashblack, we see a helicopter land on Lian Yu, enter the temple there and help Black Siren to her feet. Who is this mysterious person? Could it be Richard Dragon? Afterwards, Dinah confronts Diggle on why he won’t fire his weapon and we see he hurt his shoulder in the explosion. Diggle doesn’t answer Dinah and get this weird sexual tension between the two as if the show is planning on putting them together. I was actually digging Dinah and Quentin together as they had some nice moments of friendship. After taking inventory it doesn’t look like Black Siren has taken any weapons but Curtis informs Dinah and Diggle that she took a prototype of his T-spheres. The three are relieved that it isn’t a weaponized version but wonder what use Black Siren could have with it. Next day, Oliver visits Rene at the hospital and gifts him with another court date so he can get custody of his daughter back. Rene is also not the only person Oliver visits at the hospital as he goes to sit with a comatose Thea. Slade also visits Thea to let Oliver know the intel on his son Joe checked out and he is on his way to Calgary. Slade then gives Oliver some advice on being a father that he takes to heart. Oliver then tells William that he has every right to blame him for his mother’s death but he will always be there for him and care for him because he is his father. A small window of a relationship opens as William agrees to see a baseball game on TV with him the next day. Felicity then calls Oliver to tell him to turn on the TV. When Oliver does, he wishes he hadn’t as it is a breaking news story that shows an exclusive photo of him as the Green Arrow. So how long will Thea be in a coma and when she comes up, what sort of person will she be? And it doesn’t look like the reveal of Oliver as the Green Arrow is going to stick based on next week’s preview.